Alex Sayz: On the roads. A lot of planning for the TopDJ Nights Summer tour, start thinking of a new Saysation mixtape and some gigs. Tomorrow me and Alaa are heading to Sälen ski resort for a TopDJ Nights gig. 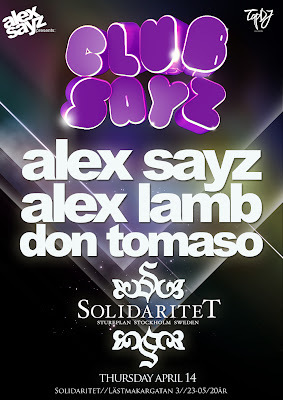 Thursday is the premiere of Club Sayz at Solidaritet, Stockholm and Saturday I will visit Platens Nightclub in Linköping.